The European tradition of formal fountains lives on in this sophisticated, garden fountain whose cascading tiers, featuring lion heads, lend soothing water music to any garden. Water cascades from an acanthus urn crown and gently flows from each lion’s head in dramatic cascades of sound. Enjoy the soft shimmer and sensuous tone of the splashing spray as this fountain takes its place as a magnificent centerpiece of your garden. 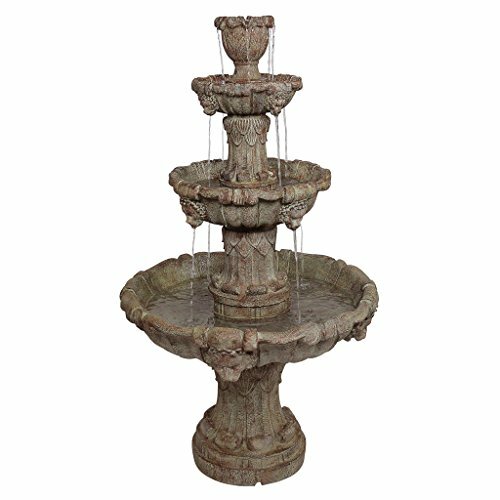 Hand-cast in quality designer resin and finished with pride exclusively for Design Toscano, the fountain is engineered for proper water flow with a built-in recirculating indoor/outdoor UL-listed pump that uses normal household current. Simple assembly required. 31½”dia.x56″H. 70 lbs.